Carpentier’s last feature film was a French production, made in 1934, after his definitive return to his homeland. Toboggan, written and directed by renowned filmmaker Henri Decoin, was by far the most interesting film in which Carpentier appeared. Decoin, it should be noted, was also the author of Quinze Rounds, a boxing novel that had won the Grand Prix de la littérature sportive in 1930. The novel is an interior monologue on the part of a boxer who is actually in the ring, fighting his last fight, a fight that, as we are informed in an introduction, will leave him having lost his mind. An interesting if not entirely successful literary exercise, Quinze Rounds demonstrates Decoin’s interest not only in boxing, but in the figure of the boxer at the end of his career, literally beaten down by the cumulative effect of thousands of punches. The figure of the past-his-prime boxer is also at the center of Toboggan. In truth, Georges Carpentier [in Toboggan] can not be judged by ordinary standards, since the ex-world champion is not an actor. Carpentier’s performance is artless, it is a simple, true, human performance, one that conforms to the cinematographic truth that dictates that people who appear on the screen should be simple, in both tone and gesture. I repeat, so that there may be no misunderstanding: Georges Carpentier is not an actor. And this is from this, cinematographically speaking, that he draws his strength and can hope for a new career, one that could be as rich in glory and profit as the one he had already had. […] let’s not forget that the screen alone has two kinds of performers: actors… and others. […] The former are professional craftspeople, engaged in a craft that can be an art, but one that they have learned and of which they have become skilled masters. The others come from here, there and everywhere, it really doesn’t matter! They have learned nothing, they are fresh and real—that is to say, unskilled and sometimes awkward. Hence their charm… On screen, they live a free life. You feel that he is a very great actor who has attained perfect simplicity in his performance. But Georges Carpentier doesn’t only act: he boxes. And that’s where he is an actor, a great one, a virtuoso; he is the boxer we knew fifteen years ago… He is as he was, the man who fought Klaus, Jeannette, Wells, Beckett. He becomes again, in the space of eight hundred meters of film, the most extraordinary pugilist that Europe, and probably America, ever knew. His gestures, his spirit, his reflexes, the supple movements of his muscles, all of these things comprise an ensemble that is so harmonious, so homogeneous, that one might think that boxing was first called the “Noble Art” thanks to this incomparable athlete. Decoin blurs the line here between fact and fiction, between actor and character, between sport and spectacle. He is not saying that Carpentier is both a wonderful actor and a wonderful boxer; he is saying that he is a wonderful actor because he is a wonderful boxer. The two acts blend seamlessly, according to Decoin. Carpentier becomes himself on screen, but his former self; he is, implies Decoin, no longer the over-the-hill ex-champion but the in-his-prime active fighter. 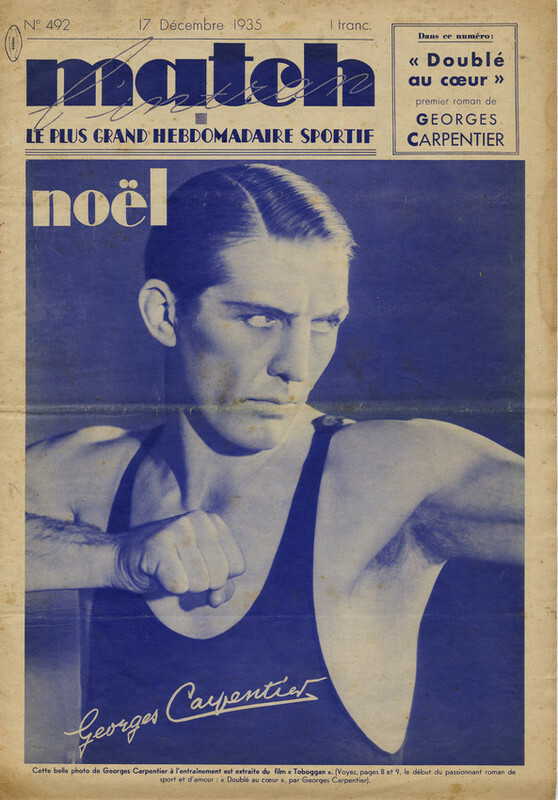 He is the pre-1921 Carpentier, before his defeat by Dempsey relegated to him to pugilistic second-class status. Carpentier’s performance, then, creates the illusion not of a fictional character come to life but rather of time-travel, of his own former self come to life. And this is possible through the vehicle of boxing. These are intriguing statements on Decoin’s part, but it is difficult to get them to square with the realities of Toboggan. Carpentier was always playing himself on screen, at least to some extent, as we have seen, but nowhere are the on-screen persona and the real-life person more closely linked as in this, his last film. In fact, only Le Roman de Georges Carpentier, his first film, which uses his real name, his real hometown, his real manager and a number of other explicitly biographical elements, is as true to the real man as Toboggan. So in that sense, Decoin is right: we are seeing the real Carpentier through the thin veil of a supposedly fictional character. But the real Carpentier of 1934 was a forty year-old ex-prizefighter, not a vibrant, forceful twenty-five year-old champion. And this is the story Decoin tells in his film, that of an ex-champion, more or less down on his luck, with only a name that is starting to fade and a wallet full of yellowing press clippings to show for the glory years that have long since passed. His ultimate attempt at a comeback in the ring is a failure, meaning that the thesis of the film, the impossibility of recapturing former glory, is directly at odds with Decoin’s statements cited above about Carpentier’s performance in the film. Carpentier the shining star of the ring does appear in the film, but only in the clips from actual fight films Decoin artfully includes in a flashback-to-the-glory-years sequence. The plot of Toboggan is fairly simple. The title of the movie reveals its primary theme. Carpentier himself, writing in 1921, a good thirteen years before the making of Decoin’s film, defines the term: “No doubt, Dixie Kid was beginning at that time to go down the toboggan, to borrow the colorful expression Americans use to designate the period of decline that inevitably comes to pass in the career of any athlete not smart enough to know when to retire.” In this case, the character on the toboggan is former champion “Georges Romanet.” In the first scene of the film, after the initial images have situated the story in a Parisian working-class neighborhood, Romanet/Carpentier punches out his neighbor, who has been beating his own girlfriend, Lisa. --Yes, I was a great boxer. You mean you didn’t know? Romanet/Carpentier takes a packet of newspaper clippings out of his pocket and begins to show them to Lisa; the name on the various clippings reads “Georges Romanet,” but the pictures are of the real Carpentier, in his prime. As he talks about his past, the image of the present-day Romanet/Carpentier and Lisa, seated at a table at a bistro, is replaced by a montage of newsreel footage of the real Carpentier, from the 1919-1925 period. There are clips from actual fight films, training footage, Carpentier in London, in Monte Carlo, arriving in New York Harbor on an ocean liner with the Statue of Liberty in the background, and so on. It is as if the two of them are watching the film along with the spectator rather than merely looking at still pictures: as images appear on screen, we hear Lisa asking Georges questions about them, to which Georges responds. Lisa says “How funny!” several times during this sequence, which seems to emphasize the dated quality of the images, underscoring the fact that Romanet/Carpentier’s glory days are long since past. At the end of the montage, when the camera had returned to Lisa and Romanet/Carpentier, the former champion nostalgically sums it all up: “Oh yes, I was handsome back then.” This strikes a chord with the spectator, because Carpentier’s looks have indeed not weathered very well. He has maintained, as he would for the rest of his life, his trim fighting form, but at forty, his lean face has already begun to look drawn and even a bit haggard. He is still a reasonably handsome man, but the years between 1921 and 1934 have taken a rather dramatic toll. Nonetheless, when Romanet/Carpentier takes Lisa to the fights at a famous (real-life) Paris boxing venue, the Salle Wagram, where a number of Carpentier’s early fights actually took place, the crowd recognizes him immediately. Romanet/Carpentier is still famous and even idolized, but only within the sub-culture of boxing fans. The general public, like Lisa, has largely forgotten him. Decoin’s film subtly but clearly makes its point about the workings of celebrity and its aftermath. Decoin makes another poignant allusion to the fleeting nature of fame in choosing to have Romanet/Carpentier, once, as we saw in the early scene with Lisa, the subject of endless newspaper articles, sell newspapers (L’Intran and Paris-Soir, both the type of popular newspapers that included extensive coverage of boxing and other popular amusements) on the street for a living. --Yes, it only lasted 76 seconds! Just one right hand and I made 296,000 francs! --Oh, that’s nothing… Listen, the first time I ever boxed, I made 10 francs. And the last time I boxed Dempsey, I made 250,000 dollars. At 25 francs a dollar, that means more than $6,000,000 francs. --And famous too. In London, I was received like a king. I ate diner with the Prince of Wales. --Of course I did, it’s really true! Boxing fans (and no doubt many others) would catch the references here to Carpentier’s real career: his celebrated 76 second KO of Beckett in London in 1919, his fight with Dempsey, his fabulous purses and even the fact of his dining with the Prince of Wales. All of these are signal moments in the Carpentier myth and clear indications of Decoin’s intention to blur the line between actor and character. If the present-day Romanet is not an exact replica of the present-day Carpentier, their histories are nonetheless identical, down to the very details. Decoin wants the spectator to lose himself in this blurring of fact and fiction, to believe in a character that is at once fictional and non-fictional. --How about your money? Did you spend it all? --Spend it? No. I bet it on the stock market, I wanted to make some money. That didn’t work out, of course. It happens. --But it’s sad anyway, isn’t it? Romanet/Carpentier may have been reduced to selling newspapers on a street corner but he will not stoop so low as to participate in a fixed fight. A crooked promoter exclaims: “You’ll be the great champion Georges Romanet again!” and goes on to propose that this goal be achieved through a series of fixed fights. Romanet/Carpentier gallantly refuses: “No fixes. I’m going to train. Then I’ll try to hold my own in there. That’s all.” Again, moviegoers, especially those with even a passing interest in boxing, would recall at this point all the controversy surrounding the Siki fight, the last truly important bout Carpentier had in France. In 1934, Carpentier had not yet owned up to having knowingly taken part in a fixed fight, so the virtuous stance taken by his alter ego Romanet served as a means of issuing a real-life denial (which is itself of course fictional, as Carpentier would reveal some twenty years later). The promoter agrees to set up one above-board fight for Romanet/Carpentier, but insists that there be an elaborate publicity campaign ahead of time. Romanet/Carpentier must be brought back to the public eye, but like a champion. The fans must not think of him as a down-and-out former fighter selling newspapers on a street corner, but rather as a high-living, tailored and bejeweled celebrity. The logic of this tactic seems to be: in order to become rich and famous, you have to already be rich and famous. So Romanet/Carpentier is given what can only be called a makeover: he moves into a ritzy hotel, is given a manicure and outfitted with a flashy, tailored wardrobe (the tailor notes: “Guess the shoulders don’t need to be padded”) that includes evening clothes. The high style and elegance, and the importance of having it endlessly and prominently represented in the press, can only recall Carpentier’s own heyday. Predictably, the formerly humble working-class Lisa quickly develops a taste for the luxury and glamor, the fancy clothes and swanky nightclubs. Also predictably, the crooked promoter declares his love to the lovely Lisa, who responds by telling him that she truly loves Romanet/Carpentier. The promoter promises Lisa that her man will win his upcoming fight against “Billy Sanders.” It is indeed imperative that he win if he wants to keep Lisa; as much as she loves him, she also loves the good life and it is difficult for her or the spectator to imagine her being the girlfriend of a man who sells newspapers on the street again. The central dramatic tension is thus established: Romanet/Carpentier will be fighting for his love as well as his livelihood. It is his last chance and everything is on the line. Decoin’s genuine interest in, and knowledge of, boxing makes itself known in the footage of Romanet/Carpentier training. We see him shadowboxing, hitting the speed bag and even sparring. In these scenes, Carpentier looks good; he is clearly in excellent physical condition and his skills are sharp. And of course, as Decoin would be the first to point out, Carpentier is not acting in these scenes. When we see him shadowbox or hit the bag or spar, he is really doing these things, not pretending to. So the audience, in those scenes at least, is seeing the real Carpentier really training. They are led to ask the same questions with respect to the real former champion Carpentier and the fictional former champion Romanet. He still looks good, but what does that mean? His skills may be sharp in the gym, but how would he perform in the ring? Is it or is it not too late for a last successful bout or two? Well, yes, the rumors going around are true. I am seriously thinking about making a comeback. As soon as this film is finished, ten days or so from now, I am going to La Guerche-sur-l’Aubois [where his training camp had been years before], where my faithful Descamps will be waiting for me, and I’m going to go back to training again. I say “go back to,” because I never completely stopped working out and I am in perfect physical condition. That night, everyone who knew Carpentier is his splendor, everyone for whom he was an idol, a legendary hero, will surely feel a little tug at his heart. Because the experience of a champion who returns to battle after a long absence has all too often turned out to be an infinitely sad one. French sport owes its most beautiful memories to Carpentier and the halo of his glory must not be tarnished. But let’s trust him. If, one day, Georges climbs back up into the ring, it will be because he thinks he will be able to conduct himself in a manner that is worthy. --Hello! I read in the papers that you want to get back in the ring… is that true? --As true as it can be! Do you have an opponent for me? “Anderson” was John Anderson, the European light heavyweight champion at the time (the shady promoter in the film will be called “Jack Anderson,” surely a wink on Decoin’s part). Carpentier, by his account, continued to misunderstand, thinking that Decoin was setting up a real bout between him and Anderson. Soon enough, the misunderstanding was cleared up and Decoin explained to Carpentier that he was proposing a film role, in which the ex-champ would square off in a fictional bout against the fictional Billy Sanders, to be played by the real John Anderson. If this version is true, then the fiction about Romanet’s comeback was actually inspired by the fact of Carpentier’s plans to do so. Decoin, having heard that Carpentier as planning a return to the ring, had the idea of casting him in a fictionalized version of that real story. While it is impossible to verify, what seems much more likely is that all the talk about a Carpentier comeback was merely hype for the upcoming movie. Knowing that what the public would find most compelling would be the blurring of lines between the real Carpentier and the fictional Romanet, Decoin and Carpentier no doubt collaborated on a story to feed to the press that was guaranteed to generate such interest. Just as interest in the fictional Romanet-Sanders fight is generated by false stories of Romanet’s wealth fed to the newspapers, so interest in Toboggan is generated by false stories of a Carpentier comeback. Given Carpentier’s age, the very considerable ring “mileage” he had on him (this was, after all, a man who had had his first professional fight at age fourteen), the length of time that had passed since his last fight (roughly eight years), and the questionable performances he had put in in the last few years of his ring career, the actual viability of a comeback was highly suspect. Carpentier, always a lucid person, surely knew this. Carpentier was also, however, a consummate showman and spinner of hype; selling tickets, whether to a fight or a movie, was something he knew how to do. The actual fight scenes in Toboggan are less than successful in creating the illusion of Carpentier as a still-viable boxer. While Decoin’s real interest in the sport is clear through the sheer quantity of footage in the ring, the quality of the fight choreography and cinematography is fairly primitive. Romanet/Carpentier looks like Carpentier (as long as you don’t look too closely at his visibly middle-aged face)—he wears, for example, his traditional ring attire of white trunks, a tri-color striped sash and black boxing boots, clearly recalling the Carpentier people remembered, and he is in good physical shape, but the fighting is not convincing. This may say as much about Decoin the director as it does about Carpentier the boxer, but is important to note that the film, like virtually all boxing films, does not do a very good job of blurring the line between fact and fiction when it comes to the ring sequences. Audiences may have enjoyed thinking about the possibility of a life-imitates-art comeback for Carpentier as they watched Toboggan, but anyone watching closely would probably have had to disengage from that fantasy. The bout itself does not follow the usual boxing movie cliché of the sentimental favorite who comes from behind for a triumphant finish. In fact, it is a reversal of that schema: Romanet/Carpentier does well for the first five rounds and it looks as if he’s really on the road to victory, when, in Round 5, he goes down for a count of 7, then again for a count of 6, and is finally saved by the bell. In the next round, the ex-champion is KO’d. A thoroughly beaten man, he’s got an unesthetic bloody nose and has been knocked senseless, to the point that he doesn’t even realize the fight is over. The boxing story line is over and the question has been answered: no, after a certain point, a fighter, no matter how glorious a career he had, simply cannot come back. Possibilities are not endless and pure intentions do not win out over physical reality. In contrast to the films Carpentier was making a decade or so earlier, in which he invariably played a hero and things invariably ended up going his way, Toboggan is a dark, pessimistic story. Even more hard-nosed than Decoin’s depiction of the reality of boxing is his cynical statement about the reality of human nature. Lisa is supposed to go off with the crooked promoter Anderson but wants to go back to Romanet/Carpentier. The spectator does not know, literally until the last minute of the film, whether she will follow her heart and opt for love with a defeated man or follow her greed and go off with a rich crook. After some genuine suspense, she ultimately decides to go with Anderson and continue living the high life. Romanet/Carpentier walks off into the shadows of Paris, alone, as we hear Lisa’s voice singing the mournful theme song of the movie, “Toboggan” (the film opens with this song as well). The song, with its chanson populaire pessimism, expresses perfectly the tone of the entire story: the inevitable deceptions of life and love, the lies and false promises, the invariable downhill slide (the final words of the song are: “But we always lie to each other/Toboggan”).This pessimism is of course about boxing, and even more so about love, but it is also about fame. Perhaps the most central thesis of the movie is that fame is based on nothing and adds up to nothing. This is a particularly poignant message, given the fact that the star of the film is a man who has no future left in the ring, has achieved what modest success he could on the vaudeville stage, and clearly isn’t much of a screen actor. Just as is the case for Romanet, the possibilities for Carpentier are extremely limited. All that remain of years’ worth of fame and fortune, the film suggests, are anecdotes and yellowed clippings. Henri Decoin decided that it would be a good thing to give us the life of Georges Carpentier on the screen. We should thank him for it. In truth, Georges, as we used to call him, is still popular. He has nonetheless stayed simple, a good guy. He has returned to us in a different form. […] His acting is real. That is the highest compliment I can give him. When he admits defeat, our former champion disturbs us, touches us. The look in his eyes contains all his past glory. This well-conceived script is a reflection of the truth. I am certain that Georges Carpentier will triumph on the screen just as he triumphed in the ring years ago. Wolff, who specifies in the review that he has seen all of Carpentier’s fights, is Decoin’s ideal spectator. Like Decoin, he values above all the “reality” of the film and of Carpentier’s performance. Without fully articulating it, Wolff, like Decoin, and no doubt like many moviegoers, finds Carpentier’s performance to be “real” because he is, for all practical purposes, playing himself. This is not method acting, an actor slipping into someone else’s skin in an eerily convincing way, this is an actor playing himself and evoking emotions that he himself might well evoke in real life. So what both Decoin and Wolff are talking about when they refer to Carpentier’s “performance” really has little or nothing to do with the craft of acting and everything to do with the simple fact of Carpentier’s appearing on screen in a thinly fictionalized version of himself. Carpentier is himself on the “toboggan” in life; watching that fact dramatized before our very eyes is what makes the film compelling. Despite Wolff’s optimistic and flattering pronouncement that he will “triumph on the screen,” Carpentier does not have a future as a screen actor, because Toboggan was the only movie he could make, the only part he could play. The beloved boxer was not, and never had been, an actor; he had always only played versions of himself. With Toboggan, the line between fact and fiction had become razor-thin and everything that could be said about Carpentier had been said. Why, since Georges Carpentier plays himself in Toboggan, didn’t they just tell the story of the real life of the boxer who was for a moment our national boxer? One is uncomfortable with this blending of reality and novelistic invention. Georges Carpentier’s performance is more than hesitant. The boxer seems stiff, at times solemn to the point of immobility, and rarely manages to attain the feeling of tension of an actor. At least Decoin skillfully take advantage of the man behind the character, especially in a amazing scene in which the boxer leafs through a scrapbook of clippings, which suddenly come to life as films of the “real” Georges Carpentier! What’s more, alongside such fine actors as Raymond Cordy or Paul Amiot, Carpentier retains an authenticity that ultimately suits the character well. At the end of the fight, beaten, with a battered face, he takes on his full dimension of sincerity or candor. As was common practice at the time, a novelized version of Toboggan, written by Paul Cartoux, was published in serial form in the daily newspaper L’Intransigeant while the film was showing in theaters (the first installment appeared on the same day as the premiere of the film at the Rex Cinema in Paris; installments appeared daily after that, through the month of November 1934). This provided an even further looping of the loop of Carpentier’s fame and a return to its origin: first created by newspapers, Carpentier’s fame is exploited in a film that itself treats, in two different ways, the question of fame generated by newspapers; that film is then transformed into prose distributed in a newspaper (which in turn serves as publicity for the film). He knew that athletic glory had smiled on him at an early age, that he had been, in his day, the most popular man in all of Paris. But he also remembered that after having showered him with all its benefits and introduced him to certain joys of life, it had cruelly abandoned him for another, a younger man of course, just like a mistress would. Then he had to descend the rungs of the ladder of fame, more quickly than he had climbed them. At a certain point, having tried in vain to face up to adversity, he had admitted defeat. Since he had not been forward-looking or prudent during the glory days, it wasn’t long before thing got tough for him; soon he was living in actual poverty. Ultimately, of course, what is most interesting and important about Toboggan is its ambiguity: the ways in which it simultaneously is and is not the story of the real Carpentier, the ways in which it is both realistic and romanticized. The Carpentier of 1934 was indeed a over-the-hill ex-champion who glory days were long past him. He was not, however, reduced to selling newspapers on the street, nor did he live in a sordid working-class neighborhood and frequent seedy bistros de quartier. Indeed, nothing could be farther from the truth. Carpentier would have been living, at the time of the making of Toboggan, in an apartment on the rue Pergolèse, a couple of blocks off the avenue Foch, perhaps the toniest residential address in Paris, in the ultra-chic sixteenth arrondissement, where he had lived since 1927. Very soon thereafter, on December 1, 1934, he moved into an apartment on the rue Fabert, overlooking the Esplanade des Invalides, in the equally chic seventh arrondissement. Toboggan tells the story of what Carpentier’s life might well have been, had he not reached unheard-of heights of fame and adulation. The real story of Carpentier is the negative image of the story told by Decoin: Carpentier was remembered, was respected, was able to live out his life in relative comfort and security. Decoin’s tale thus underscores just how exceptional the story of the real-life Carpentier was. The moral of the story is that fame is fleeting and heroes often end up in the gutter, which is precisely what might well have happened, but did not happen, to Carpentier. It is important to note, however, that this way of viewing Toboggan is only possible in retrospect; in 1934, Carpentier’s future was not certain at all. Neither Decoin nor Carpentier knew for sure where life would lead the former idol of France. It was at an actual turning point in Carpentier’s life that the film was made, given the fact that the first of the several upscale bars that would both bear his name (and thus keep it in circulation) and provide him with an occupation opened the following year. Spectators in 1934 knew that the very fact of Carpentier’s starring role in the film they were watching meant that his was not the down-and-out existence being represented, but they did not necessarily know that he would not end up in some comparable situation at some point. This adds yet another layer of complexity to an already extremely complex relation between fact and fiction in Toboggan. It is fitting that that dizzying mélange of the real and the imagined, of sport and spectacle, of fame and obscurity would be Carpentier’s last appearance in front of the camera as an actor.